Share your wild salmon recipes! Wherever you are in Alaska, you can harvest the most wild and sustainable ingredients imaginable – like wild salmon from the waters that wind through the Tongass National Forest. These salmon taste amazing, are incredibly healthy, and support the local economy in southeast Alaska. 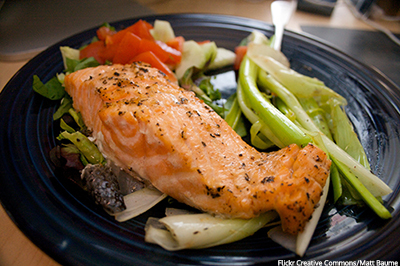 You can also purchase wild Alaska salmon in the lower 49 states, and we want to know how you like to cook it. Today, in grocery stores across the US, you can buy a variety of wild salmon to make the connection between our dinner plate and the importance of sustaining wild salmon stocks and healthy forest ecosystems. To celebrate this special forest and its delicious flavors, please share your favorite recipe for salmon - either the recipe itself, or a link to it below. Don't have a recipe? You can still read what others suggest, including a League favorite here. When you take action you will be signed up for periodic email alerts and communications from Alaska Wilderness League.